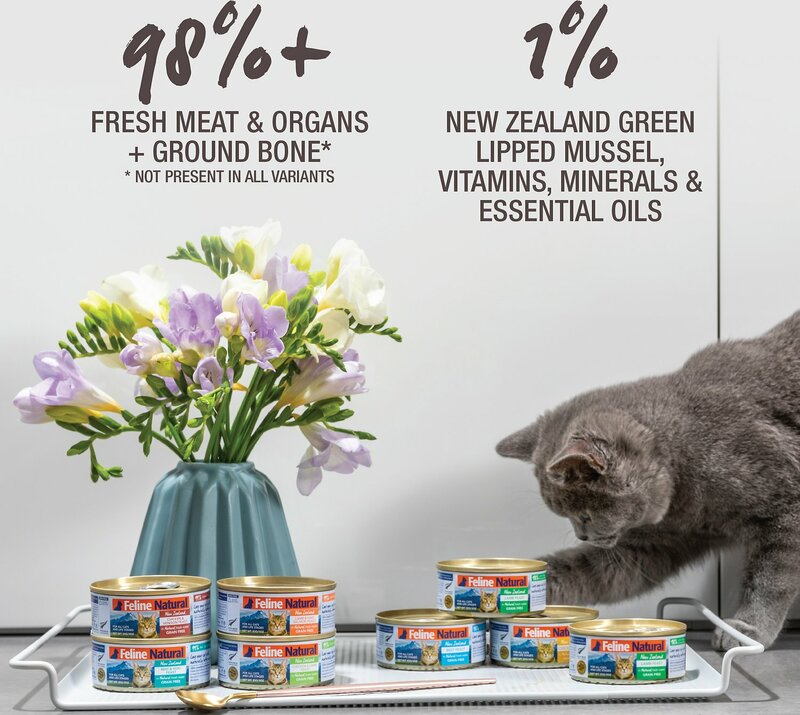 Feline Natural Chicken & Venison Feast Grain-Free Canned Cat Food is made from all-natural, free-range, grass-fed chicken and venison sourced from only the finest sources in New Zealand. Green lipped mussel is added to provide the highest concentration of omega-3 fatty acids found in any marine or plant life, while being an excellent source of glucosamine and chondroitin. Feline Natural doesn’t use any wheat, rice, soy or gluten, which makes it great for felines with food allergies. 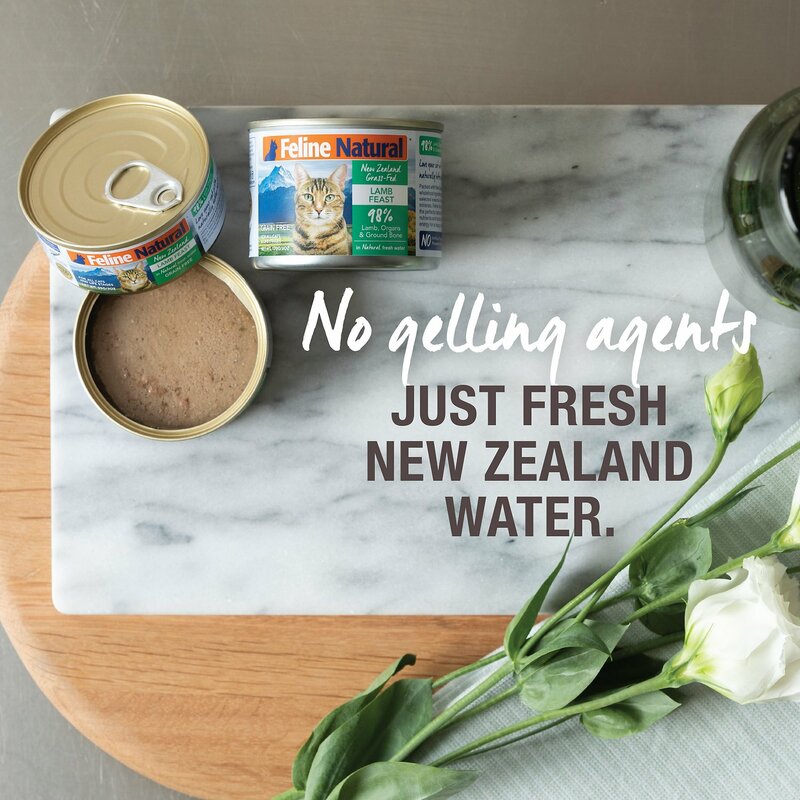 And it contains no artificial ingredients, additives or preservatives, and is free of all gelling agents—the only thing added is natural, fresh New Zealand water. It’s a nutritionally appropriate diet for all breeds, and can be fed to cats at any stage of life from kittens to seniors, and during pregnancy and lactation. Chicken, Chicken Heart, Venison Kidney, Venison Liver, Venison Blood, Flaxseed Flakes, New Zealand Green Mussel, Dried Kelp, Taurine, Vitamin E Supplement, Magnesium Oxide, Zinc Proteinate, Copper Proteinate, Manganese Proteinate, Thiamine Mononitrate, Vitamin D3 Supplement, Folic Acid, Water added for processing. Feeding recommendations are a guide only as your individual cat's requirements may vary by +/-50%. Adult: For every 6.6lbs of cat’s weight feed 2x 3-oz cans or 1x 6-oz can per day. Always introduce any new diet over a period of 7-10 days, gradually feeding more Feline Natural and less of the previous food until the transition is complete. Is this product in compliance with AAFCO? Feline Natural is formulated to meet AAFCO requirements for all life stages, from kittens right through to adults. Absolutely! All Feline Natural products and their ingredients are GMO-free. Why is there canola oil in your Feline Natural recipes? We’re glad you asked! To ensure that our products contain the necessary amount of nutrients through seasonal variations in our ingredients, we have carefully selected a handful of essential vitamins and minerals to add to our recipe. Canola oil is used as a binder for these goodies, which you’ll be pleased to know makes up 0.001% of the actual recipe. 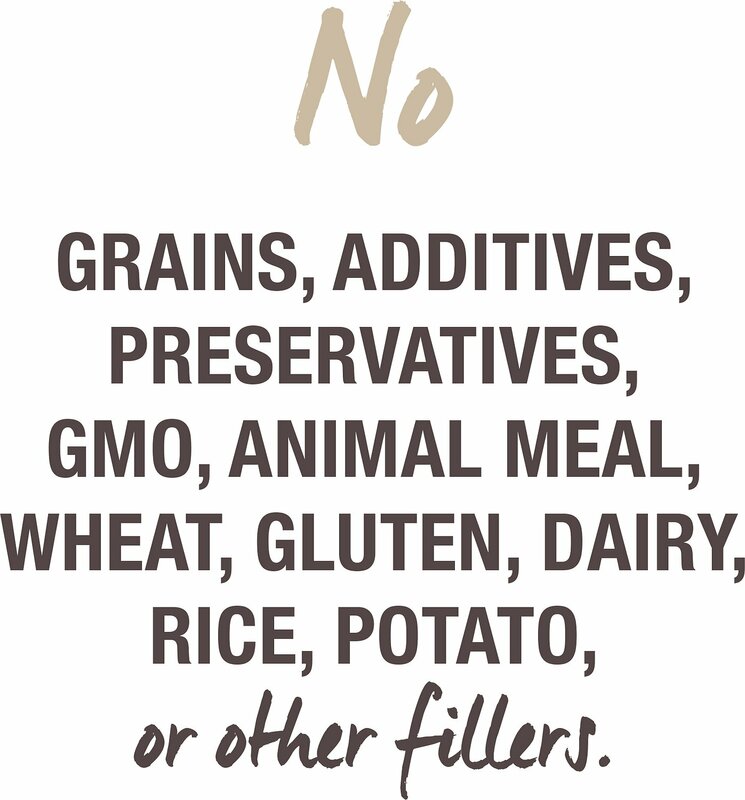 All of our wholefood ingredients are grown and sourced locally and sustainably in New Zealand including canola oil, which is GMO free. Is this canned food raw? Our canned range contains the same wholefood goodness of our other recipes, which has been canned for your convenience. The product is heated during the canning process leaving all the nutrients inside the can. The best part - we don’t use any gels or binders whatsoever! The only thing we add is natural New Zealand water. Does Feline Natural use HPP (High Pressure Processing)? Not us! 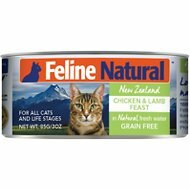 Feline Natural does not use any form of high pressure processing/pasteurization in the production of this product. Feline Natural is dedicated to sniffing out the best ingredients to bring to your pet's bowl. Using free-range meat and sustainably sourced produce, the recipes are all handmade in the company's own kitchen by a dedicated team of pet lovers. With passion poured into every can and bag, the result is unparalleled quality that keeps pets thriving. Everything is made fresh in New Zealand, and that's because it's the perfect place to find natural, pure ingredients. 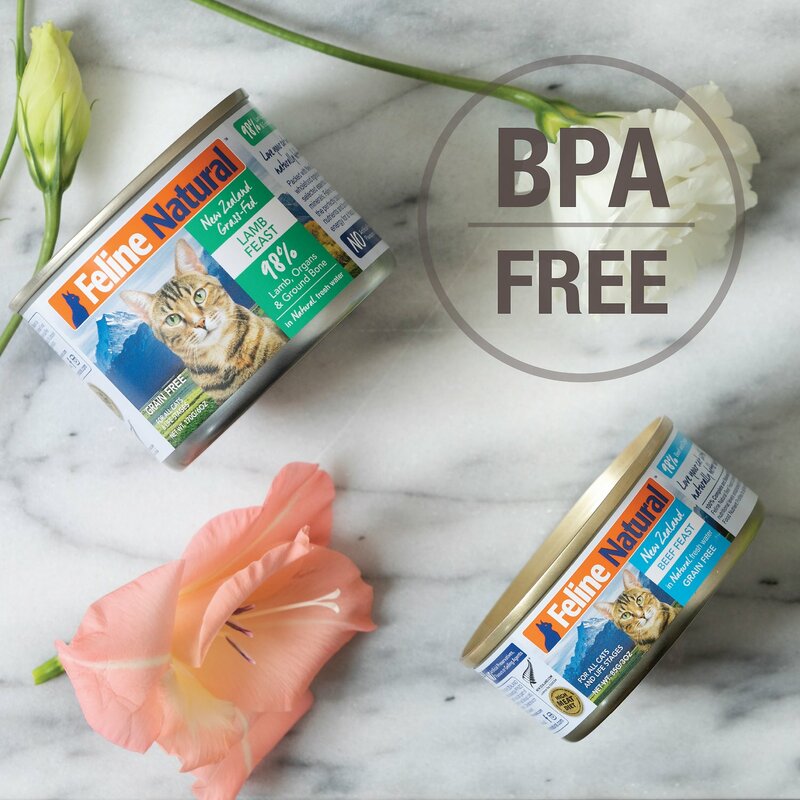 With resources like grass-fed animals, cage-free chickens, and the most fertile soil on earth, Feline Natural uses only the best. They practice a farm-to-bowl policy thanks to a close relationship with local farmers, and every human-grade product can be traced back to its source. Because nothing is more important than safety, Feline Natural employs only the highest standards when it comes to production. Every diet is supported by world-class research from their own animal nutritionist, who works with two of the leading animal research institutions in the Southern Hemisphere. The Feline Natural's story began in 2006, with a team of passionate pet lovers who wanted to give dogs the best recipes that nature had to offer. That was K9 Natural, and since they didn't want leave out the cats, Feline Natural soon followed. Operating under the highest standards, their selection of freeze-dried foods, canned food and treats provide the ultimate nutrition for the health and well-being of beloved pets across the world. Very disappointed with this food. My cat wouldn’t even try it and now I’m stuck with a partial case of 23. Ugh! I thought it was a case of 12 cans of chicken, 12 cans of venison. Sure I can donate them and all that,but this food wasn’t cheap. I wanted a high quality food so my thinking was, more expensive, better quality. I'm not telling anyone that owns cats anything new when I say, they won't eat it. (One cat will lick it and walk away). Finding a cat food that isn't sold in a grocery store that a cat will eat and stay healthy eating is like finding that proverbial needle in a haystack. I'm still searching. The feral we feed is getting better and better every day though, so that's a good thing, right? I am so happy a cat food is finally available with no additives like guar gum, artificial colors, flavors or other non-real food ingredients. This cat food is expensive but the best. My 3 cats love it and I am grateful to the manufactures. It looks and smells like meat which is what cats need to be truly healthy. Thank you Chewy for finding this food! Some of my fussiest eaters like this! 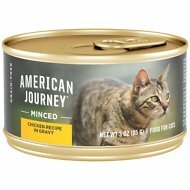 I gave this to two of my older cats, about 12 years old, who are very fussy about what they eat and they really like it. They don't want the same can more than once a day, so they have to have a variety of foods, and this one was a winner. It has quite a bit of water in it, but the meat amount seems equal to other brands. This product is a winner. Sammy loved this food. When he was eating Weruva he would drink all the juice but leave a lot of the meat. He devours this food and leaves nothing .I believe it is better for him too. Better ingredients excetera. My 1.5 year old cat loves this food. I feed him on rotation of different brands/flavors, and he will meow at me and won't finish the food if I give him different ones. all 8 of my beautiful felines Love This - It makes me so happy to be feeding them something with healthier/natural ingredients! Miss kitty loves it see gets it two times a day.She likes the turtle with cat Nip in it plays with it till it is gone. The circle scratching thing with ball she Uses and plays with a lot. I have 4 cats with varying and, often conflicting, tastes and sensitivities. So far, this food seems to be loved and tolerated by all. It disappears quicker than anything else.